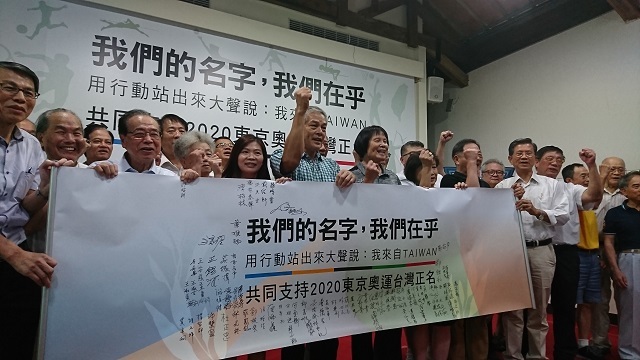 In the afternoon on July 17, a press conference for name rectification referendum, led by Mrs Chi Chen, a famous three times Olympics sprint medal winner, proposing to change current name of “Chinese Taipei Olympics Committee” into “Taiwan Olympics Committee” and apply to International Olympics Committee for accepting Taiwan using her own name to participate the 2020 Tokyo Olympics. Mrs Chi Cheng expressed, during her three times participation of Olympics game in 1960, 1964 and 1968 rspectively, she was introduced as a sprint athlete from “Taiwan”. Meanwhile, on the electronic billboard on the Olympics stadium, the nationality of Taiwan athletes then were also all registered as “TWN” in the 1960s, witnessed Mrs Chi Cheng.